Corporations are people, and that’s why Hobby Lobby should lose at the Supreme Court. And that’s why Hobby Lobby should lose at the Supreme Court. Hobby Lobby should only have the rights of legal personhood that are essential for its operations. At next week’s arguments, the Supreme Court will debate whether business corporations have religious liberty. Hobby Lobby, a chain of craft stores with 13,000 employees, along with a small Mennonite furniture maker, seek exemptions from the Obamacare requirement that employer health insurance plans cover certain forms of birth control. The case raises anew the question that sparked so much controversy after the Citizens United case: Are corporations “people” with the same rights as citizens? Corporate personhood is easily ridiculed on late-night television, but as Eric Posner pointed out in Slate, the law often “treats various nonhuman, nonsentient entities as ‘persons’ for certain legal purposes.” Yet that doesn’t mean Hobby Lobby has all the rights you and I have. Indeed, the justices should hold that Hobby Lobby does not have religious rights precisely because the corporation is a legal person. Corporate personhood has two essential features. As Posner notes, personhood is merely the law’s shorthand way of saying that certain entities have legal rights. As a legal person, the corporation has the right to own property. It has the right to form contracts. If either of those rights is interfered with, the corporation has the right to sue in court. The second feature is separation of the entity from the stockholders. The company’s property is held in its own name and belongs to it, not to the investors. If the corporation breaches a contract, it’s the company, not the individual stockholders, that is responsible. If the corporation is harmed in some way, the individual investors are not allowed to sue. The corporation has to do it. In recent constitutional law cases, however, the justices seem to have forgotten this basic principle of corporate law. In Citizens United, the court effectively held that corporations enjoyed the same free speech rights as ordinary individuals. Contrary to popular belief, however, the court did not base that holding on the idea that corporations are people. Instead, the justices said that corporations are “associations of citizens”—and those citizens who make up the corporation have constitutional rights. In the Hobby Lobby case, the owners of the craft store chain make the same mistake. The owners claim that their personal religious beliefs would be offended if they have to provide certain forms of birth control coverage to employees. Yet Hobby Lobby’s owners aren’t required by the law to do anything. The legal duty falls on Hobby Lobby, the company, not its owners. If Hobby Lobby fails to provide the required insurance, the company, not the owners, is responsible. 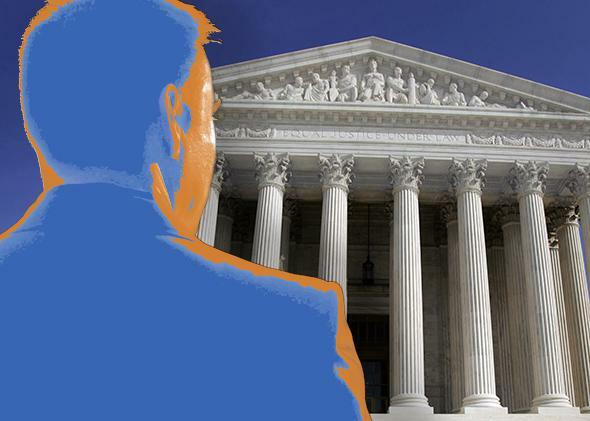 What the owners want is for the Supreme Court to “pierce the corporate veil”—legalese for looking behind the corporation’s legal identity and basing a ruling on the interests and desires of the owners of the firm. But Hobby Lobby’s owners only want to pierce the veil for this one issue. They want the court to vindicate their personal beliefs on birth control, yet they still keep the protections of the corporate form for everything else, including limited liability. Hobby Lobby should only have the rights of legal personhood that are essential for its operations. As legendary Supreme Court Chief Justice John Marshall wrote nearly 200 years ago, “Being the mere creature of law,” the corporation “possesses only those properties which the charter of its creation confers upon it either expressly or as incidental to its very existence.” Perhaps that includes some limited speech rights, as we ordinarily expect firms to advertise and communicate with employees and customers. Yet religious liberty is not one of those rights. Hobby Lobby is a for-profit corporation whose business doesn’t require it to have religious freedom. In fact, granting Hobby Lobby an exemption from providing contraception coverage, a requirement that applies to other companies, would make the firm less attractive to potential employees. Religious liberty is certainly appropriate for some not-for-profit corporations, like churches or nonprofits with a religious mission. If Hobby Lobby’s owners wanted to form such an organization, there was a convenient and readily available option: They could have incorporated as a nonprofit. They wouldn’t be able to make the same kind of money, but they’d have a corporation with an explicitly religious mission. And under the Affordable Care Act, they’d be exempted from the birth control requirement. Hobby Lobby’s owners, however, formed a business corporation. By asking the Supreme Court to let them enjoy all the protections of this corporate form, but not all of its duties, Hobby Lobby’s owners want to have their corporate cake and eat it, too.